Two recently weaned monk seal pups brought to Ke Kai Ola are now receiving rehabilitative care, while two other monk seal patients are on the cusp of release. Two endangered Hawaiian monk seals recently arrived at Ke Kai Ola, The Marine Mammal Center’s hospital in Kailua-Kona, Hawai‘i. The two new patients are weaned pups from Laysan Island in the Northwestern Hawaiian Islands that were suffering from malnourishment. The young female is named Maiapilo, which is a hardy, drought- and heat-resistant plant native to Laysan with a beautiful, fragrant flower. The young male is named ‘Ākulikuli, which is a low-crawling plant that loves the beach area. ‘Ākulikuli was about 24 pounds lighter than his companion and had a few lacerations on his face and a small ulcer on the roof of his mouth, but like Maiapilo, is active and otherwise doing well. 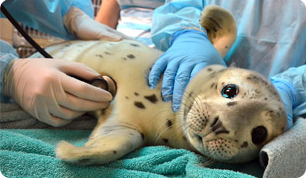 Hurricane Olivia delayed the seals’ trip to our hospital. The NOAA research vessel Oscar Elton Sette that had rescued the seals in the Northwestern Hawaiian Islands had to go into port at Pearl Harbor to seek shelter as the hurricane approached the islands. But the patients were never in danger as the ship was the safest place for them to weather the storm. Animal Care Manager Megan McGinnis was onboard the ship and ensured that Maiapilo and ‘Ākulikuli started receiving treatment before they even reached our hospital. While on the ship, Maiapilo was given a de-worming treatment to remove her parasites, and ‘Ākulikuli received antibiotics for his mouth ulcer. Three times a day, they both received fish-mash smoothies to help them get the vital nutrients they need to regain their health. Once the storm had passed, Maiapilo, ‘Ākulikuli, and the accompanying researchers and caretakers set sail toward the Big Island. Upon arrival to Ke Kai Ola, Maiapilo and ‘Ākulikuli joined two young patients already there – Sole and RK58. You may remember these two pups arrived at Ke Kai Ola earlier in the summer after being involved in mom-pup pair switches that left them orphaned and unable to get the nutrition they needed to survive. Sole is currently free-feeding fish, a clear and reassuring sign he has learned how to be a wild Hawaiian monk seal! RK58 is not quite at that stage yet, but our animal care experts say that he is “oh-so-close.” They expect that Sole and RK58 will be ready for release soon! Researchers aboard the Oscar Elton Sette added more good news: a former patient, Meleana, was resighted looking healthy and at home among the 1,200-mile archipelago of small islands and atolls known as the Northwestern Hawaiian Islands. She was admitted to Ke Kai Ola in 2014 for being prematurely weaned and weighing half of what she should have weighed – an unfortunate but common fate for monk seal pups. The resight is significant because it demonstrates the long-term impact of our work to save this species. Since opening the hospital in 2014, The Marine Mammal Center’s veterinary experts have successfully rehabilitated nearly two percent of this endangered population, returning 23 healthy monk seals to the wild with four more now in our care. Researchers estimate the current monk seal population to be about 1,400 animals, and about 30 percent of those monk seals are alive today directly due to conservation efforts. Young seals are the most vulnerable animals in the population, with relatively few surviving to adulthood. Pups and juvenile seals in the Northwestern Hawaiian Islands often fall victim to threats like entanglement in ocean trash, changes in the food chain and predation. Hawaiian monk seals are also highly sensitive to climate change impacts. Sea-level rise and increased coastal erosion will reduce the haul-out sites they depend on, and may increase shark predation. Increasing sea surface temperatures will limit available prey for marine mammals just as it has on the West Coast of the United States. Maiapilo and ‘Ākulikuli will stay at Ke Kai Ola while they gain strength before returning to the Northwestern Hawaiian Islands where they were rescued. As these seals mature and have pups of their own, monk seal experts hope this will improve the species’ chances of survival in the islands that have been their home for millions of years. The Marine Mammal Center's team also monitors Hawaiian monk seal haul out activity on the island of Hawai‘i and manages rescue efforts for sick and injured seals reported to the hospital’s 24-hour hotline (808-987-0765). Thanks to generous donors much like you, the Hawaiian monk seal population has been given a second chance at life in the wild. You can make a real difference for this endangered species and all of the marine mammals in our care by making a gift today. Read more about Working With Endangered Species. Find out about the Current and Released Patients at Ke Kai Ola. Adopt your own Hawaiian monk seal! Help save the Hawaiian monk seal by adopting KP2, a young pup that was rescued on the island of Kauai. The adoption package includes a personalized certificate with a photo of your adoptee, plus your own 12" Hawaiian monk seal plush toy.